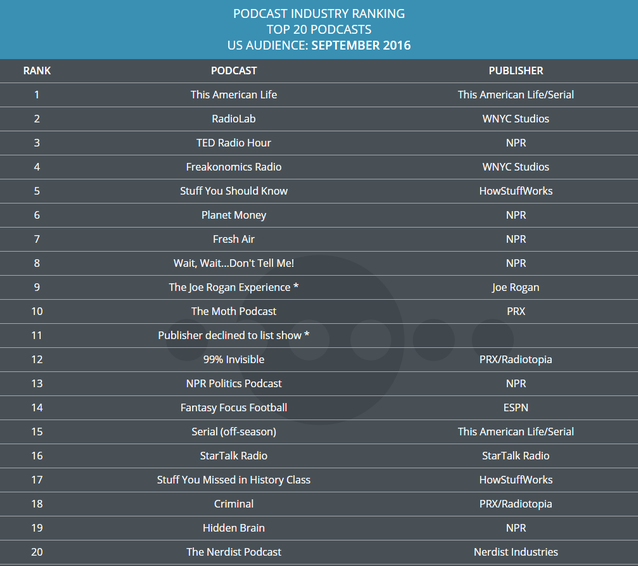 Podcast measurement company Podtrac today released its Top Podcasts report for September. It is the second monthly edition of that report, which started in August. In May of this year, Podtrac launched its Podcast Industry Ranking, which lists the top 10 podcast publishers. Invisibilia (NPR) dropped off from its #20 position in August. Fantasy Football Focus (ESPN) joined the September list at #14. Unsurprisingly, NPR is the heavy-hitting publisher in the September list, as it was in August. This time, six NPR shows made the list. PRX is represented three times, WNYC twice, and this American Life/Serial twice (for This American Life and Serial, it probably would go without saying). That means that non-commercial producers are responsible for 13 of the 20 shows.